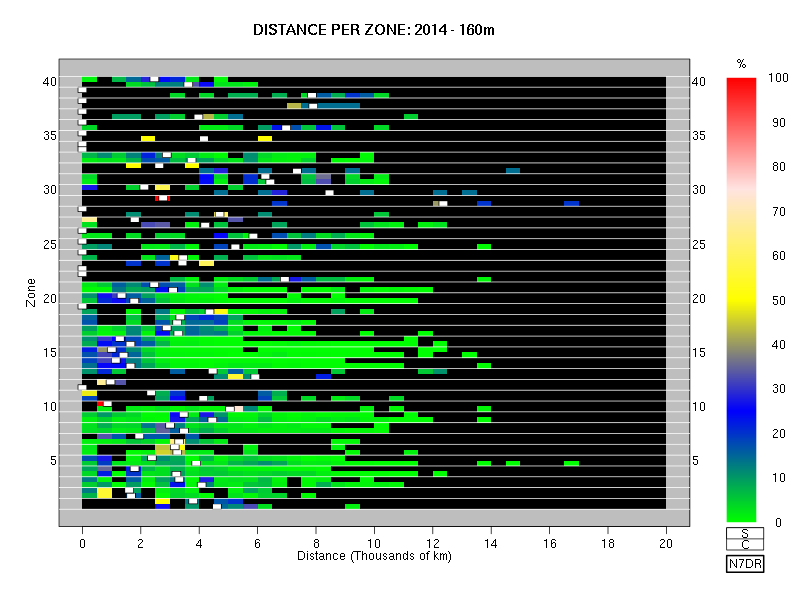 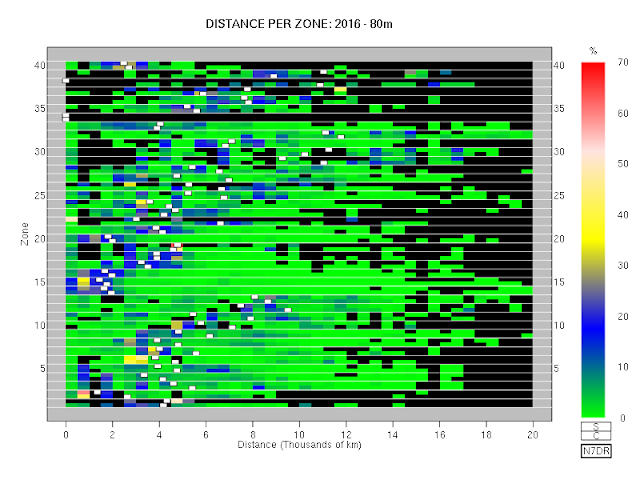 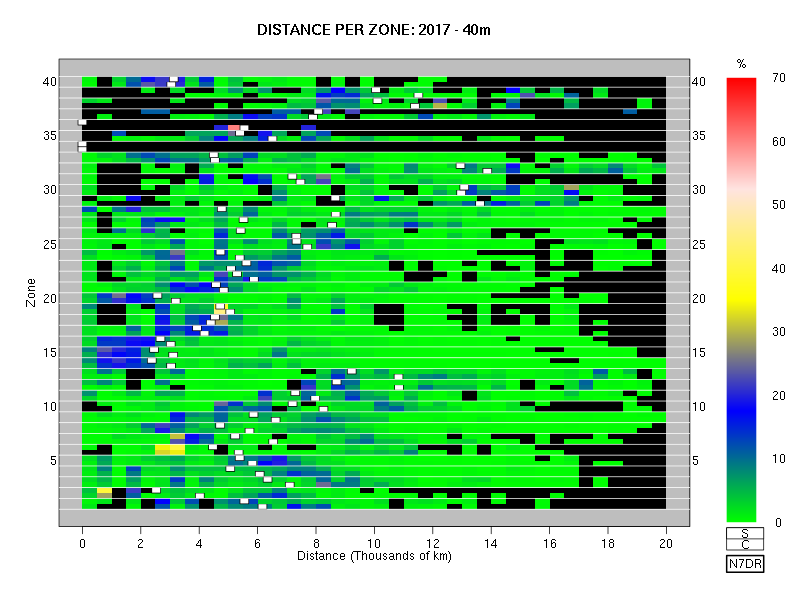 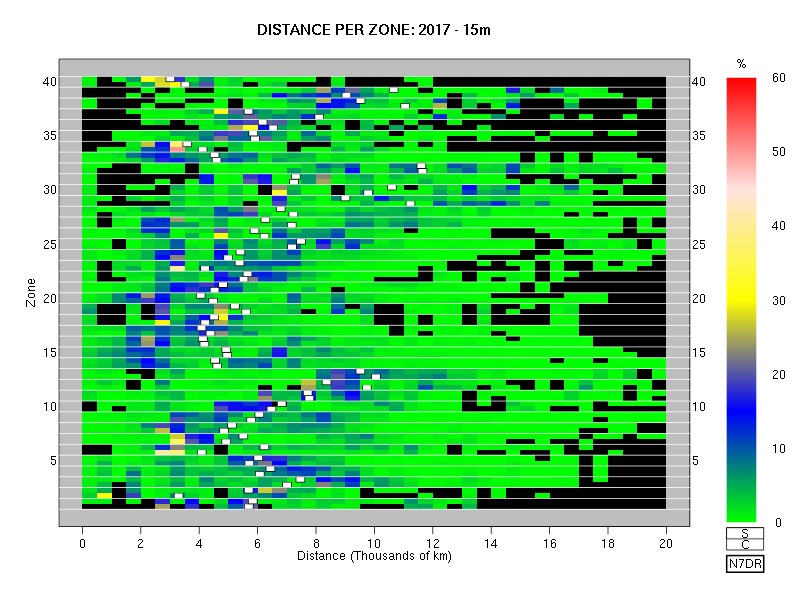 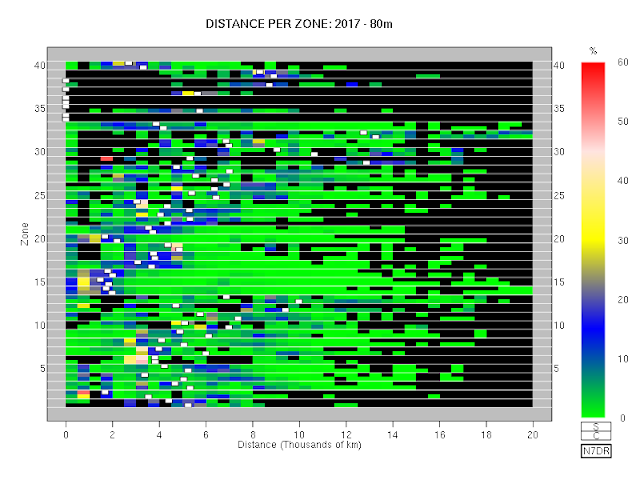 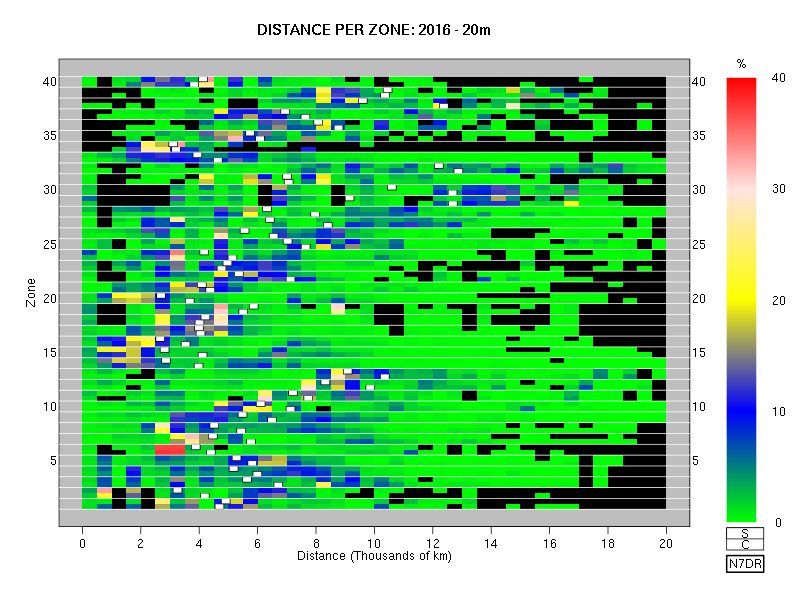 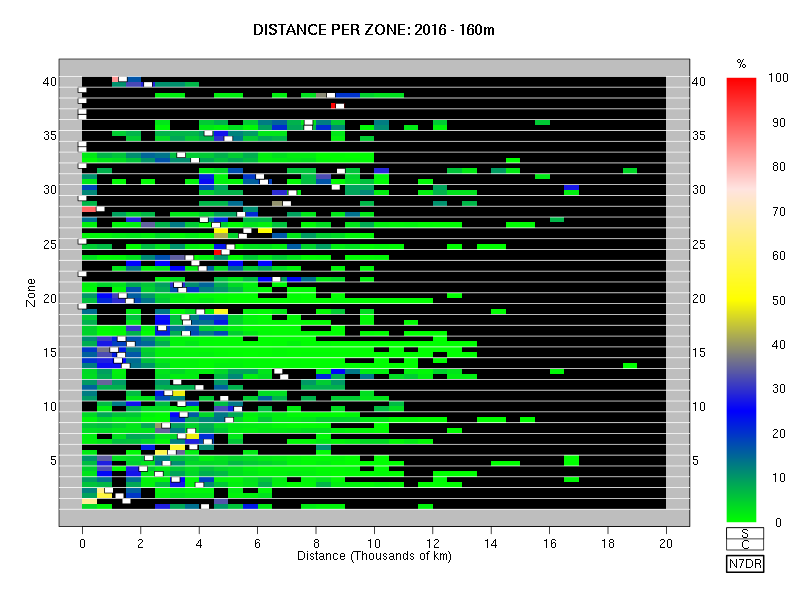 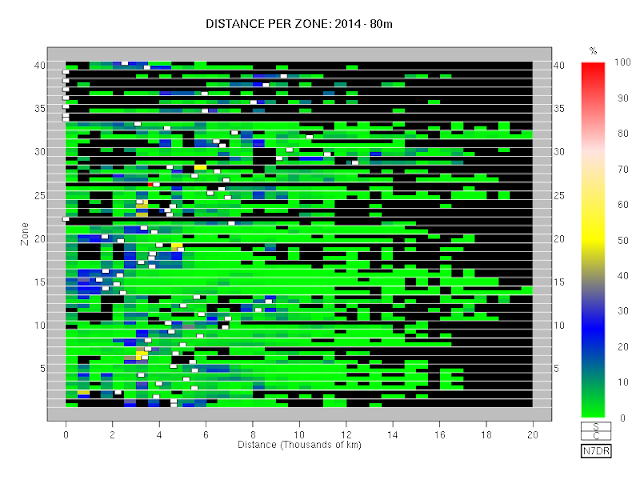 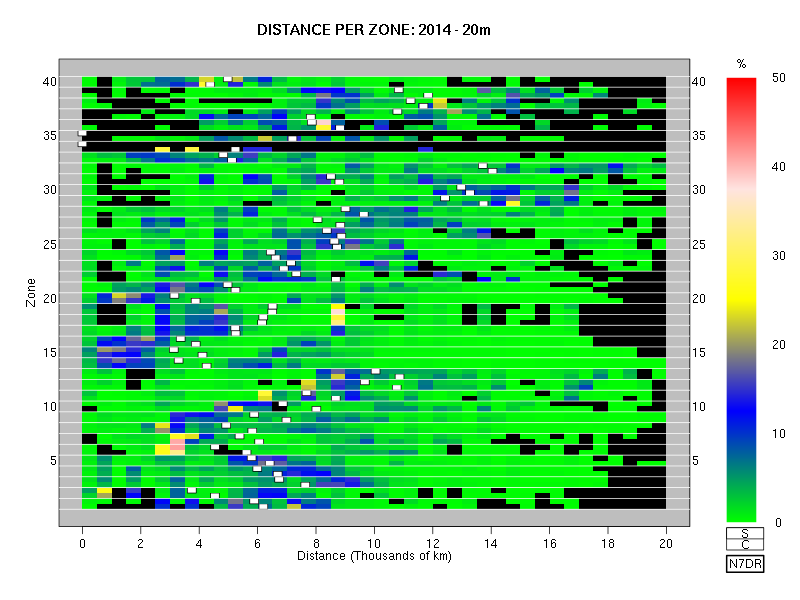 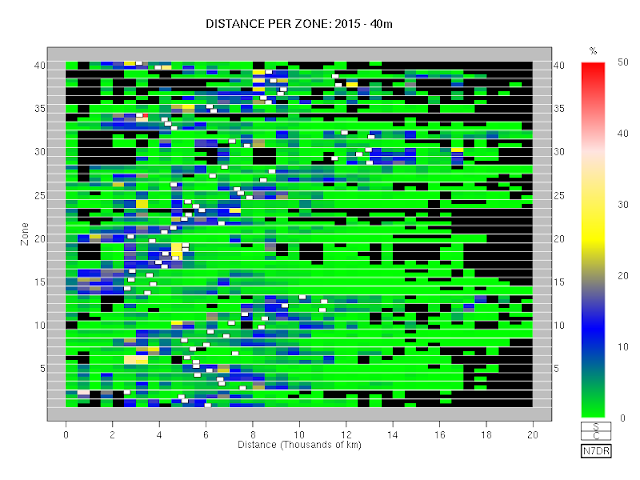 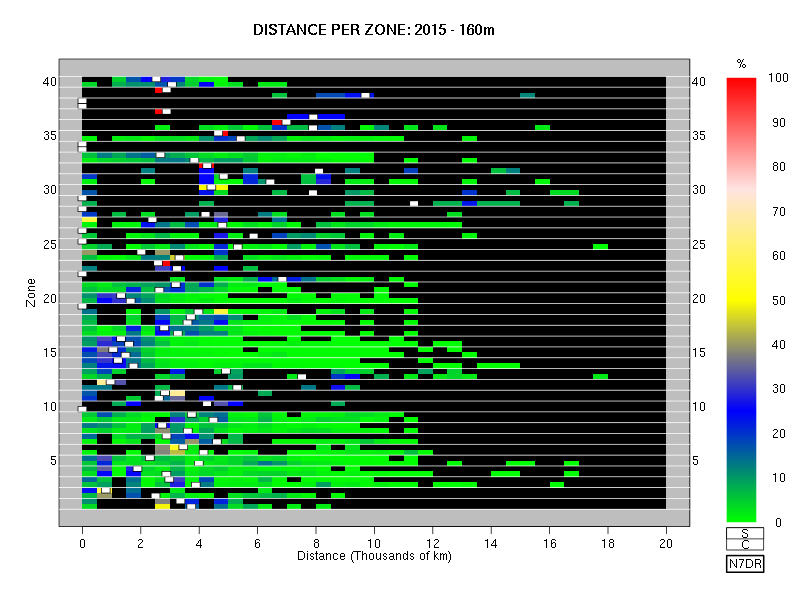 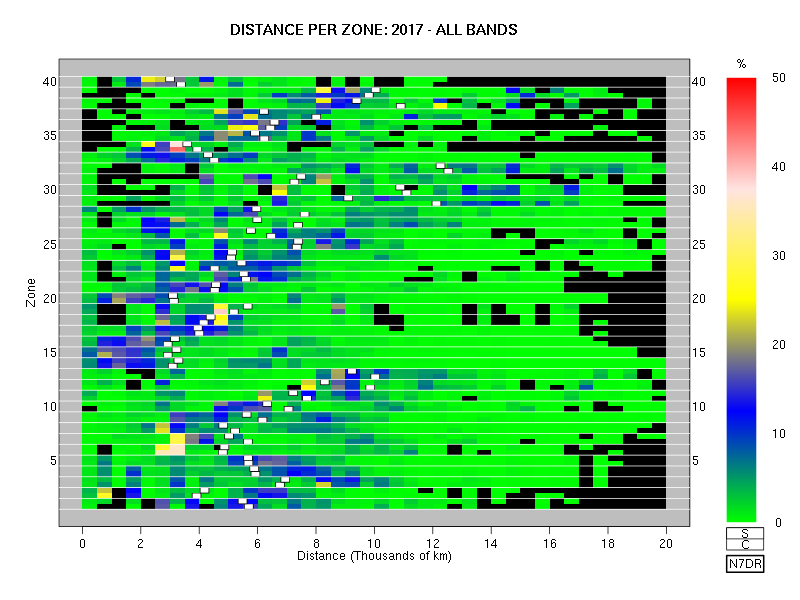 Below are plots of the signals from six DXpeditions to top-50 most-wanted entities that took place in 2018, as recorded by the Reverse Beacon Network. Below is a series of figures showing this distribution integrated over all bands and, separately, band by band for the CQ WW SSB and CQ WW CW contests for 2017. Below is a series of figures showing this distribution integrated over all bands and, separately, band by band for the CQ WW SSB and CQ WW CW contests for 2016. Revised augmented versions of the logs for the CQ WW CW and SSB contests are now available for the period 2005 to 2018. 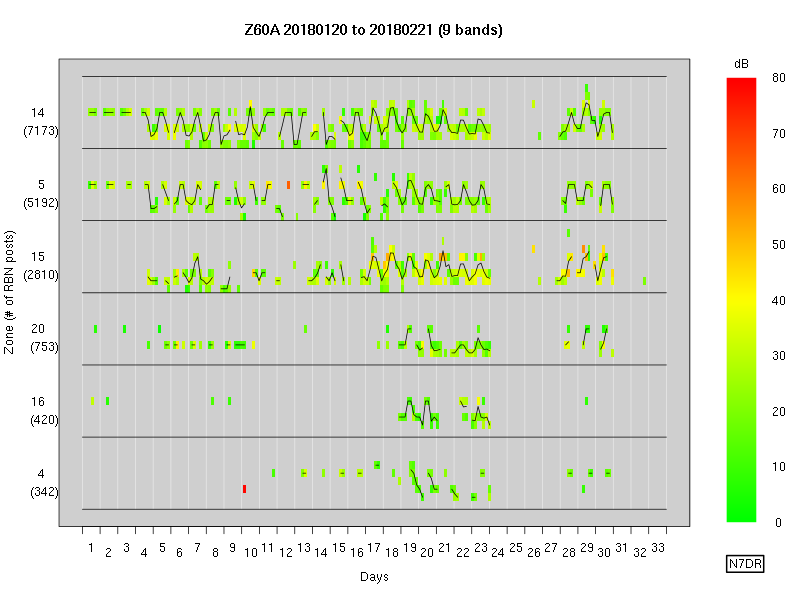 These logs for the first time incorporate data from outside the logs: they contain a column based on data from the Reverse Beacon Network (RBN). 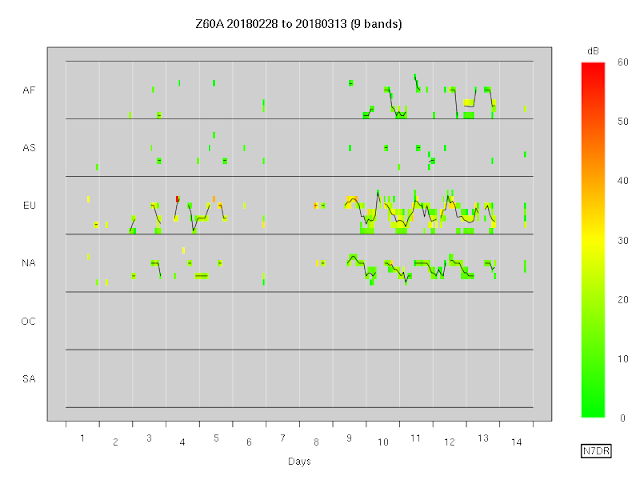 Links to the augmented logs may be followed here. 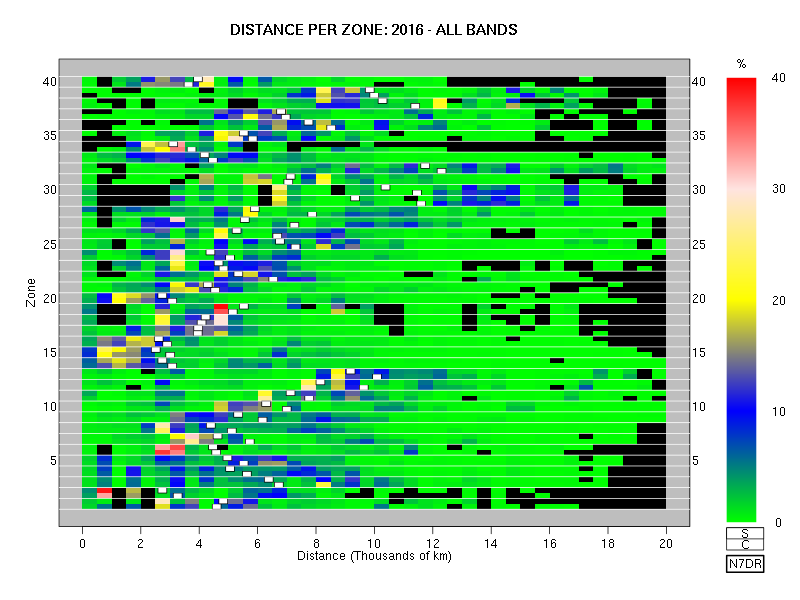 a. letter "A" or "U" indicating "assisted" or "unassisted"
If the QSO is a reverse zone bust, the zone logged by the second party; otherwise, the placeholder "-"
If the QSO is an ordinary zone bust, the correct zone that should have been logged by the first party; otherwise, the placeholder "-"
In the CW contests from 2009 onwards, the RBN was active, automatically spotting the frequency at which any station calling CQ was transmitting. To reflect possible use of RBN information, the augmented files now include a fourteenth column. For the sake of uniformity, this column is present in all the augmented files, regardless of whether the RBN actually contributed useful information to a particular contest. No useful RBN-derived information is available for this QSO. 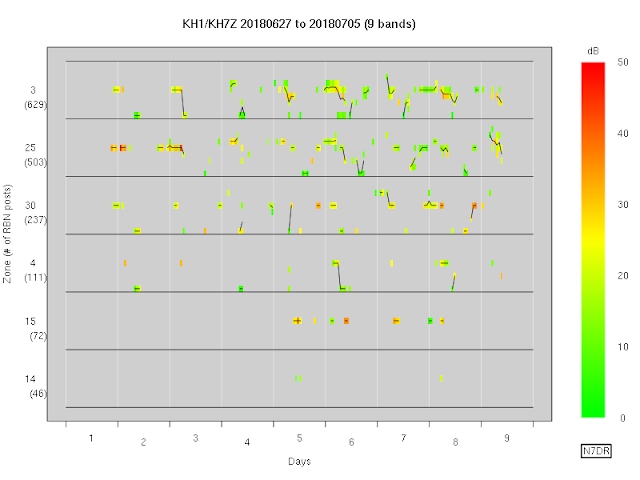 The worked station (i.e., the second call on the log line) appears to have begun to CQ on this frequency within (roughly) 60 seconds prior to the QSO. For the nth letter of the alphabet: the worked station appears to have been CQing on this frequency for (roughly) n minutes prior to the QSO. The worked station appears to have been CQing for more than 26 minutes on this frequency. Because the the RBN is distributed, and because each contest entrant station has its own clock, there is generally a skew between the reading of the clock of the station making the QSO and the timestamp from the RBN at which it believes a posting was made (indeed, it's unclear from the RBN's [lack of] documentation exactly how the timestamp on an individual RBN posting is to be interpreted). If the character '<' appears in the the RBN column, it indicates that the raw values of the clocks suggest that the QSO took place up to two minutes before the RBN reported the worked station commencing to CQ at this frequency. When this occurs, the most likely interpretation is that there is non-negligible skew between the two clocks, and the station was actually worked almost as soon as a CQ was posted by the RBN. 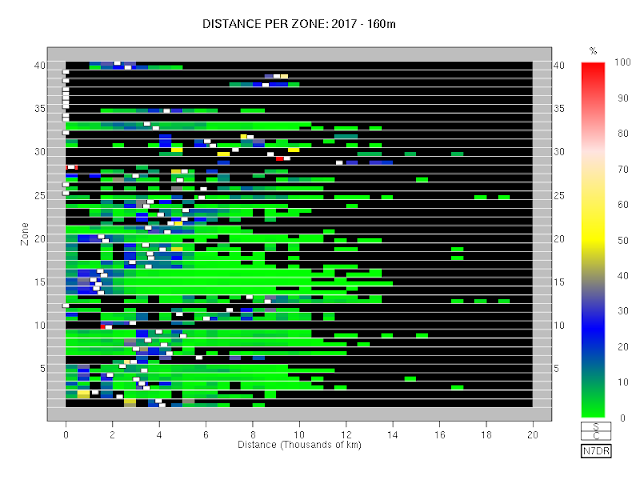 But it might also mean that the entrant was simply lucky and found the CQing station just as it fired up on a new frequency. I made no attempt to deduce or infer the run status of a QSO in the second party's log (if such exists), regardless of the status in the first party's log. 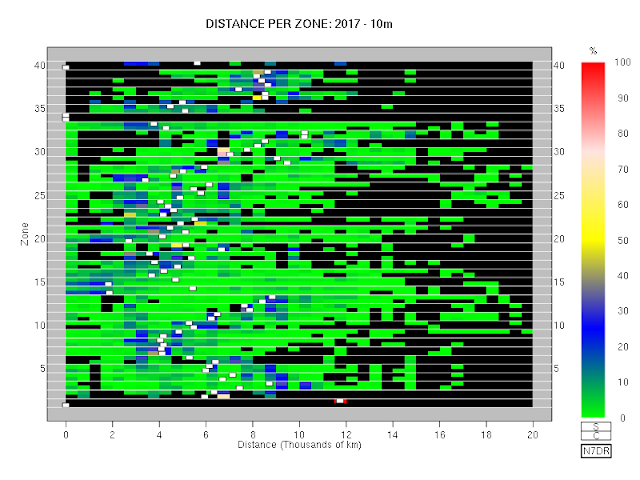 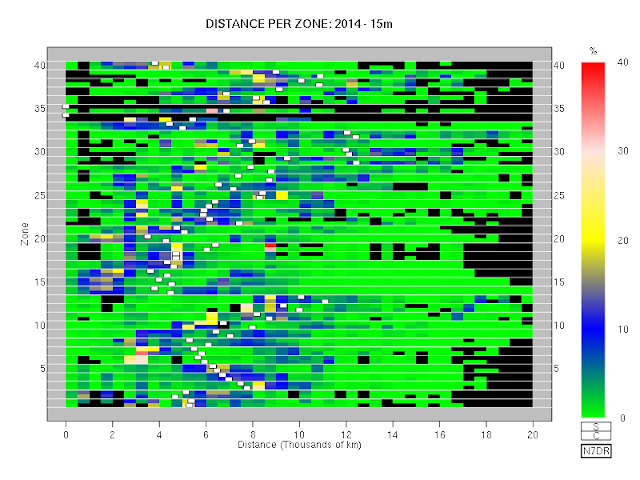 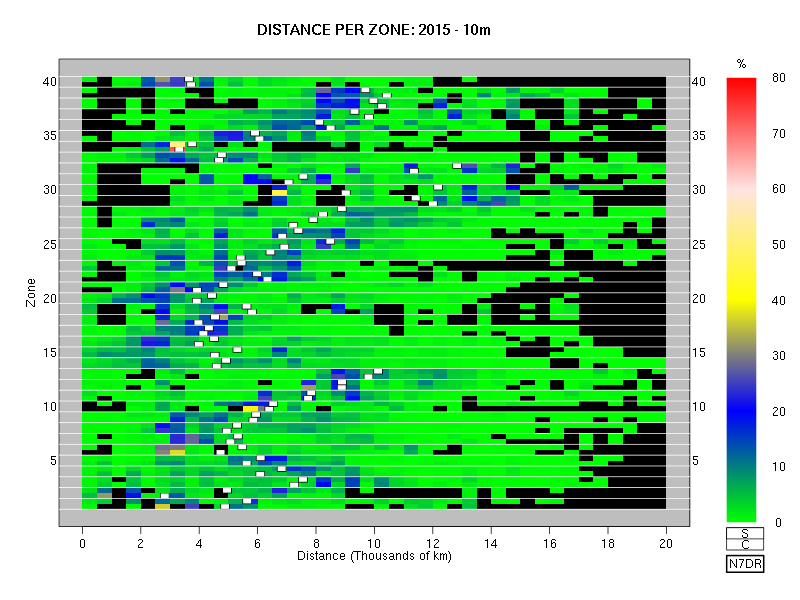 This allows one cleanly to perform correct statistical analyses anent the number of QSOs made by running stations merely by excluding QSOs marked with a U in column k.
The entries for the zones in the case of zone or reverse zone busts are normalised to two-digit values. Below is a series of figures showing this distribution integrated over all bands and, separately, band by band for the CQ WW SSB and CQ WW CW contests for 2015. Below is a series of figures showing this distribution integrated over all bands and, separately, band by band for the CQ WW SSB and CQ WW CW contests for 2014. I find the official general instructions for building and installing ROOT annoyingly unclear and ambiguous, so this post describes how to perform installation of a so-called "Location Independent" (i.e., non-system-wide) build of CERN's ROOT package on Debian stretch. 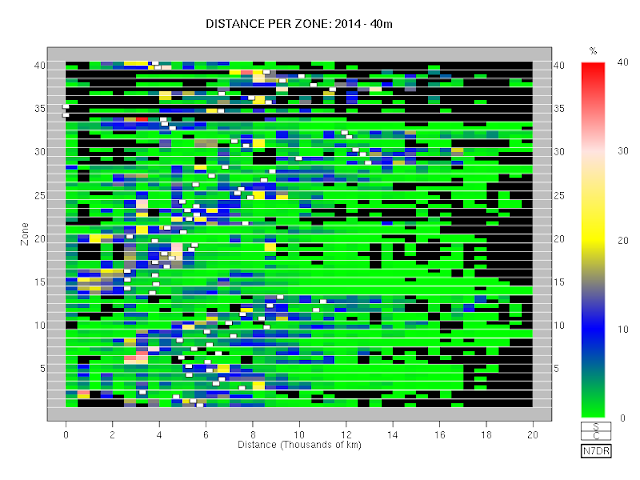 I assume that cmake is already installed, and that you're using bash or something similar as a shell. 2. Determine the version of ROOT that you want to download (see, for example, https://root.cern.ch/downloading-root). Do other stuff for a couple of hours or so, because buliding ROOT takes a long time. When the build has completed, a complete hierarchy based at ROOTroot should have been built. On my system, that hierarchy runs to about 3.1 GB. to your ~/.bashrc file, or its equivalent for your bash-like shell.